Ricky Gervais is the first to admit that his teeth are neither white nor straight - and Americans mistakenly think he wears bad false teeth for comedic purposes. Why the dental divide? These are my real teeth. You think I'd wear them all the time if they weren't real? So much character, in fact, that Ricky Gervais says one US journalist complimented him on being prepared to wear unflattering false teeth for his role as an English dentist in his latest film, Ghost Town. Only he didn't. "He was horrified that I could have such horrible real teeth. It's like the biggest difference between the Brits and the Americans, they are obsessed with perfect teeth," says Gervais. Unlike many British stars hoping to make it big across the Atlantic, Gervais hasn't bought himself a Hollywood Smile. But what is it about the bright white and perfectly straight teeth of Los Angeles that Americans love - and expect of their public figures? "Americans have the idea uniformity is equivalent to looking good. The British character is more free-spirited, more radical," says Professor Liz Kay, dean of the Peninsula Dental School in Exeter and Plymouth. "US teeth are sometimes whiter than it is physically possible to get in nature - there is a new reality out there. The most extreme tooth bleaching is terrifying, it looks like it's painted with gloss paint and has altered what people perceive as normal," says Professor Jimmy Steele, of the School of Dental Science at Newcastle University. 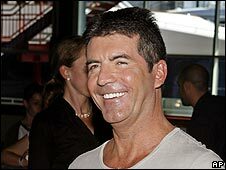 The British traditionally prefer "nice natural smiles - natural in colour", he says, and have had a more functional view of teeth and dentistry, whereas Americans have always seen teeth more aesthetically, hence the rise of the artificial smile in show business and pop culture. Cue jibes such as The Bumper Book of British Smiles which cajoles Lisa Simpson into having a brace, and Mike Myers' mockery of buck-toothed Brits in Austin Powers. Conversely, in the UK the snide remarks are saved for those who have had obvious work done, such as Simon Cowell or glamour model Jodie Marsh. When it was widely reported that Martin Amis had secured a book advance in 1995 to help "do his teeth" - which the author denied - he was lampooned by critics. And more recently there has been much speculation over whether Gordon Brown has had a smile makeover. He now performs cosmetic dentistry on a wide spectrum of patients, from an 82-year-old woman with overlapping teeth who finally wanted to "do something for herself", to a 17-year-old worried that fluoride had given her mottled teeth that were whiter than normal. "Dental tools can do an awful lot of damage if used inappropriately. Crowns can mean a perfectly good tooth has to be cut down, which can weaken the tooth or damage nerves in the long run," he says. 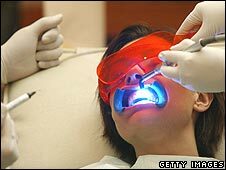 "Quite often teeth whitening is a 40th or 50th birthday present," he says, a procedure that can be done in a dentist's chair in two hours for about £650. A more intensive "smile makeover" - perhaps involving veneers, crowns and reconstruction work - can take months and cost anything from £2,000 to £10,000. On average, cosmetic procedures account for a third of a dentist's income from non-NHS work, according to research by the British Dental Association. Among Mr Fallowfield's patients is Jenny Horton, 36, who has had four crowns redone, six new ones added and her lower teeth whitened after she had a baby. "The first thing I notice on people is their smile," she says. "I wanted a confidence boost - I was putting my hand over my mouth before, now I can smile. And the compliments have come flooding in: people haven't noticed my teeth, but say I look well." But Brits haven't embraced the full Hollywood makeover - yet. "Americans don't mind this unnaturally white look. It's a new phenomenon, like buying a Rolls Royce and telling the world. They are wearing a smile as a badge," says Mr Fallowfield. Nor do aspiring actors and actresses need to get a new and very expensive set of pearly-whites, says Sylvia Young, of the eponymous theatre school. "A trip to the orthodontist can be a good idea, to get the teeth straightened if need be." "A lot of people in his place would have had their teeth fixed in this day and age. But for comedians, it's good to look unique." Mostly US kids get braces after their baby teeth fall out and then you go to the dentist once or twice a year. Stars are under a much finer microscope so they take more extreme measures, but we really don't obsess about it that much. The fact is, straight teeth are healthier, easier to maintain and look better. It takes very little effort to have this done the way the majority in the US do it. I actually have never had an major dental work, including braces, outside of fillings and cleanings. I guess I don't understand why having healthy straight teeth is considered a bad thing. It's not a lot of work. It's hilarious really, all the cosmetic dentistry means that people end up looking like they have false teeth, Frank Butcher style. May appeal to some, but certainly doesn't to me. I have long thought that most women look better with their natural teeth than a row of perfect brilliant white teeth that look like a row of tomb stones. 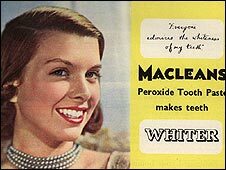 The famous model Dovima (Dorothy Horan) had a unique natural beauty when she first started modelling in the early 1950s, but in my view she ruined it by having her teeth crowned. To me a row of perfect white teeth just says "American woman", give me the natural look any day. As an American, I must admit that I scoff at people that have crowned, whitened, and straightened their teeth. I grew up with relatively straight teeth so I feel fortunate. But I remember when I was quite young, before cosmetic dentistry existed, my father implored my mom to have all of her upper teeth removed because one tooth, just one, was not quite in place. She conceded and I believe always resented that because she quickly found dentures not only unnatural but uncomfortable. Cheers to natural smiles everywhere, ones with natural character and beauty. Good for Ricky Gervais. I'm an American and for years now I've thought those glow in the dark preternaturally white teeth look weird. I've all my teeth, and at the age of 53 they've a nice mellowed ivory colour, but they're sound. That's enough for me. This article is heavily flawed, it is not a battle between ultra worked-on teeth and brown jagged gnarly teeth. Brits should just start doing what Americans do, brushing their teeth and going to the orthodontist as children if it is necessary and within an individual's budget. A few hundred years ago tooth decay and rot were a leading cause of death. You only come with one adult set so why not take care of them? I'm American and I have very straight, very white teeth that have never had braces or been whitened, and I've never had a cavity. We have had fluoride in our water since the 70s - we have better, healthier teeth because of it. Andrew in Cincinnati: WE! DO! CLEAN! OUR! TEETH! (and a good number of my friends had orthadontics too) The point of the article wasn't that clean teeth are a waste of time, but that real teeth don't stay that white without actually bleaching them. It's not as if one can just ignore tooth decay, but having creamy-colour teeth is not tooth decay. And slightly off-kilter teeth don't damage anyone's health. Let's not also forget that fluoride has been added to the water supplies of Canadian and American towns and cities to assist in dental health since the late 1960's. We here seem to object to something as simple and basic as this which has major implications to good dental hygiene and less cost to the NHS. Go figure! Wow, Andrew from Cincinnati seems to have a poor impression of Brits! I'm sure (nearly) all clean their teeth and go to the dentist. The difference seems to be in the level of cosmetic manipulation undertaken on all parts of the body (I'd only ever seen people who'd had facelifts on the TV before my recent trip to the US). Perhaps Brits are just a bit less obsessed with celebrity "perfection"? My parents were too poor to afford dental work for themselves until adulthood. I on the other hand went to the dentist every four to six months from the time my first tooth appeared. I am thankful that, unlike my parents, I do have straight and white teeth. I do find the unnatural glow-in-the-dark white teeth of some disturbing. That said, I also must be quintessentially American in that I don't understand why anyone with the means wouldn't want straight white teeth. Surely the concern should not be to point a laugh at a handful of Americans for going to far with cosmetic dentistry, when so few people in Britain do not have access to an NHS dentist. Britons pride themselves for providing socialized medicine to all - but there has been a systematic collapse in dentistry that has largely occurred without public outcry. But after all no-one likes going to the dentist, do they? Yeah cause of course we Brits are so far behind the Americans that we never brush our teeth, have never heard of an orthodontist and certainly would never dream of taking our kids to a dentist. How foolish can some people be? Wake up - perfect white teeth look totally fake. This is why the American version of extreme makeover churns out clones every time. It is ok to have your own look. I have a gap in my teeth and I think it's cute. As an American cosmetic dentist, I must say I hold a similar disdain for smiles that are so white and perfect that they are obviously fake. Such teeth are as bad as an obvious facelift or oversized breast augmentation. I want the patient to look like they were born with a beautiful smile, not be a walking neon sign. That said, many of my patients demand it. Doing a case on someone who has been self conscious of their teeth their whole life and giving them a reason to smile with confidence for the first time is an amazing feeling.